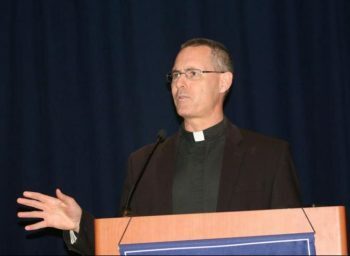 TUCSON, Ariz. (CNS) — If people are going to serve the immigrant community, they always must look for the good being done by that community, said Jesuit Father Sean Carroll, executive director of the Kino Border Initiative. He made the comments in a keynote speech on the first day of CLINIC’s annual convening May 30-June 1 in Tucson. CLINIC, short for Catholic Legal Immigration Network Inc., was founded in 1988 by the U.S. bishops hoping to create a network of loosely affiliated diocesan immigration agencies. He talked about starting the Kino Border Initiative in 2009, and how Catholics who favor strong immigration laws can be magnets for dialogue with strong supporters of reforming immigration laws. Father Carroll also cited an interruption to a homily he once preached, which led to small discussion groups at a coffee hour following Mass. Also, witnessing how quickly U.S. citizens can cross back into this country — compared to the labored passage of those lacking passports and other documentation — can lead to a rush of emotions, including fear and bitterness, eventually leading to a numbing effect. “What helps you with it? What helps you get up in the morning and show up every day?” he asked. It begins with being well-centered, stepping away and making sure to deal with your own feelings regularly, he said. The immigrants themselves, with their perseverance and faith, also provide inspiration to him, Father Carroll said. He spoke of the more than 40,000 meals served at the Kino Border Initiative’s “comedor,” or kitchen, on the Sonoran side of the U.S.-Mexico border last year, and of the hundreds of women and children also assisted through their shelter near the comedor, as examples of the good things going on in the ministry. Hang on to hope, he added.